Thomson's Bellflower is a plant up to 1 m tall. Roots are elongated, fusiform. Stem is hairless to slightly hairy. Leaves are lanceshaped to ovate, hairless to velvety, margin toothed to slightly sawtoothed, lower leaves stalked, upper stalkless or nearly so. 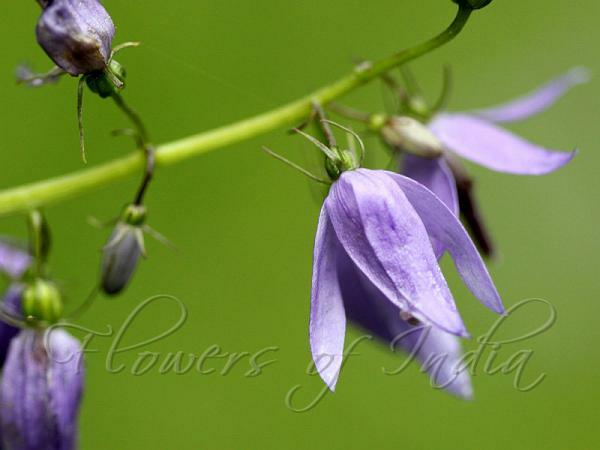 Flowers are stalked bell-shaped, blue, about 1 cm long, stalked. Sepals are threadlike to linear, each 5 mm long. Petals are linear to lanceolate, united at the base, 5-6 mm long. Filaments are short, velvety, anthers oblong, surrounding the style. Style with 2 stigmas. Fruit is a globose capsule with persistent sepals. Seed is 1.5 mm long, dark brown, oblong, smooth. 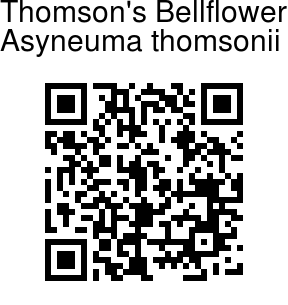 Thomson's Bellflower is found in Afghanistan and NW Himalayas, at altitudes of 1500-2500 m. Flowering: May-August.